Heavy rain has been falling in Texas after Hurricane Humberto, the first hurricane to hit the US Gulf coast in two years, came ashore on Thursday. One person was reported to have been killed and there were fears of flash flooding in areas already inundated in the wettest summer in 100 years. Power was knocked out in some districts by Humberto's 85mph (140km/h) winds. By mid-morning, the hurricane had weakened to a tropical storm and had moved into neighbouring Louisiana. At 1500 GMT, Humberto was 125km (75 miles) west-northwest of Lafayette in Louisiana with winds of 100km (75 miles) per hour, the National Hurricane Center in Miami reported. Humberto had strengthened quickly to a Category One hurricane before making landfall early on Thursday, but then rapidly lost strength. Some 100,000 customers were without electricity in Beaumont and Port Arthur in Texas, a spokesman for Entenergy Texas said. Three oil refineries were also shut down after losing power. No evacuations had been ordered as Humberto neared the coast of Texas. But Texas Governor Rick Perry activated military rescue teams including helicopters and water rescue workers. "Some areas of our state remain saturated by summer floods, and many communities in this storm's projected path are at high risk of dangerous flash flooding," he said. At least 40 people have been killed in flooding in Texas this year. 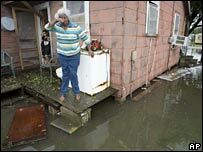 The National Hurricane Center in Miami said four to six inches of rain (10-15cm) of rain were expected across much of Louisiana and Mississippi. Humberto was the third hurricane of the 2007 Atlantic storm season. But it was far weaker than the deadly Hurricanes Dean and Felix which both reached Category Five status - the most powerful on the five-point rating scale - before lashing Central America, the Caribbean and Mexico.